Americans love living in coastal communities. As per the National Oceanic and Atmospheric Administration (NOAA), 39 percent of the U.S. population lives in the 10 percent of land area that comprise the contiguous U.S. coastal zone. By 2020, an additional 11 people per square mile will move to coastal areas. The Environmental Protection Agency states that 23 of the 25 most populated counties in America are coastal. With these trends, increased pressures are placed on these ecologically sensitive and biologically diverse areas. 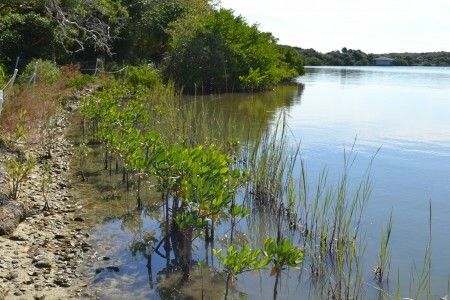 This article briefly details successful living shoreline projects on Florida’s east coast: in Mosquito Lagoon waters within the boundaries of Canaveral National Seashore. These projects were created and are being led by Dr. Linda Walters (Pegasus Professor), Melinda Donnelly (Ph.D. candidate with Dr. Walters) and their team of undergraduate and graduate students from the University of Central Florida (UCF). Unique partnerships with local, state and federal agencies (such as Brevard Zoo, National Park Service, Coastal Conservation Association, New Smyrna Beach Marine Discovery Center, Indian River Lagoon National Estuary Program, local public schools from five counties and NOAA) have enabled interdisciplinary and cross-sectoral collaborations and learning. Besides being attractive places to live and visit, coastal areas and intertidal habitats are recharge zones for aquifers, nurseries for fishes, habitat for wildlife and buffer zones for storms. Areas where intertidal habitats have lost their flora and fauna become bare shorelines prone to erosion. The loss of these habitats represents a loss of valuable ecosystem services, such as shoreline stabilization, wave buffering, filtration of nutrient-rich terrestrial run-off and habitat for numerous marine and terrestrial fauna, including economically important species. Natural resource/environmental managers and planners are challenged to protect, restore, stabilize and manage coastal areas in a sustainable manner accounting for increased impacts from human populations, natural hazards and sea level rise. Synergistic effects of natural and human impacts can limit the natural recovery of these critical intertidal habitats. Multiple techniques have been used to prevent erosion along these altered shorelines. Hard-armoring techniques, such as the construction of sea walls or covering of shorelines with rip-rap, are often used. However, these methods are expensive, require maintenance and eventual replacement, disrupt the link between terrestrial and estuarine habitats and reduce habitat for native species. 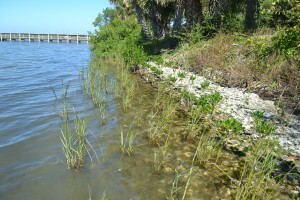 In 2012, the Florida Fish and Wildlife Conservation Commission’s Comprehensive Wildlife Conservation Strategy identified shoreline hardening as a major threat to marine and estuarine habitats. An alternative to hard-armoring methods is soft-armoring or living shoreline techniques, which utilizes native plants and animals to restore the shoreline’s natural structure and function. These methods are becoming more desirable and accepted. Methods now exist to make soft-armoring effective over the long term, especially with expected climate change and sea level rise scenarios. Upper intertidal zone: Rhizophora mangle (red mangrove) and Avicennia germinans (black mangrove) seedlings planted two plants per meter. Mid-intertidal zone: Spartina alterniflora (smooth cordgrass) transplants planted three plants per meter. Lower intertidal zone: stabilized oyster shell to recruit live oysters (Crassostrea virginica). At Seminole Rest, there was a mean increase in sediment of 3.0 cm within six months after oyster shell bags were deployed, compared to a loss of sediment of 1 cm per month or more before restoration. Survival of red and black mangroves and smooth cordgrass ranged from 65 percent to 75 percent per species and percent cover of vegetation increased from < 2 percent to 47 percent after six months. At all locations, the team has documented 42 species of birds, fishes and invertebrates using mixed mangrove and smooth cordgrass shoreline habitat in restored and natural coastal wetlands. Intertidal habitat supports federally listed species including wood storks and Atlantic salt marsh snakes and multiple species of special concern, such as brown and white pelicans, wading and shorebirds. Mosquito Lagoon waters are listed as Fish Habitat Areas of Particular Concern by NOAA for snapper, grouper and bull sharks that come to these shallow, protected waters to forage and give birth. In addition, mangroves and smooth cordgrass benefit commercial and recreational fisheries by providing essential habitat for stone and blue crabs, shrimp, spotted sea trout, red and black drum and mullet. The voluntary nature of the projects allows students from multiple disciplines, including public administration, urban and regional planning, emergency management and biology to combine theory, practice and service-learning by actively participating in restoring and stabilizing the shoreline. School-aged children in central Florida public schools grew the plants used in restoration. Hundreds of community volunteers created the stabilized oyster mats. In addition to volunteers helping prepare materials, they helped with community deployment days (150 at Eldora and over 300 at Turtle Mound and Seminole Rest). The totals are 720 linear meters of shoreline stabilized (these three sites plus a few other significant shell midden sites) and over 5,500 volunteers total.